Well-known in Barcelona and beyond, the Palau Sant Jordi is an emblem of sport and large-scale events. Forever associated with the 1992 Olympics, it continues to be a living reminder of those glorious events and at the same time forms part of present day Barcelona, with major events held there each year. It is also considered to be a a masterpiece of modern architecture. The Palau Sant Jordi is a pavilion which, over the course of the city's history, has had multiple functions,hosting everything from large scale sports events to the concerts of artists such as Bruce Springsteen. 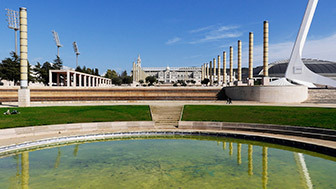 It is considered to be the jewel of the so-called Olympic Ring, situated in Montjuïc Park, which is comprised of a number of sports facilities that were created or remodelled for the 1992 Barcelona Olympic Games. Considered to be a masterpiece of modern architecture and engineering, the building was built in 1990 by Japanese architect Arata sozaki. It served as one of the main pavilions for the Olympic Games, hosting the artistic gymnastics competition and volleyball. It was also the main venue for the Paralympic Games that year. 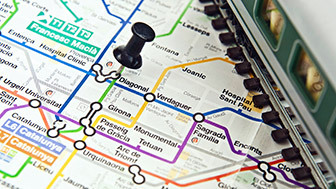 Sant Jordi is also well known for hosting the biggest concerts held in the city.It has played host to performances by artists such as Madonna, Frank Sinatra and Beyoncé, and local residents tend to associate this venue with large scale music events. 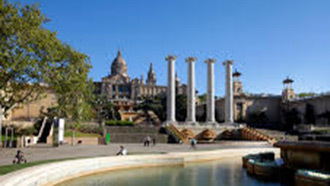 Its privileged setting, among the green vegetation of Montjuïc, and all the history it holds within, have made it the star sports facility of the Olympic Ring and a place that is visited daily by tourists, travellers and locals alike.